Warning: This is not a post about beautiful interiors! But wait, yes it is! 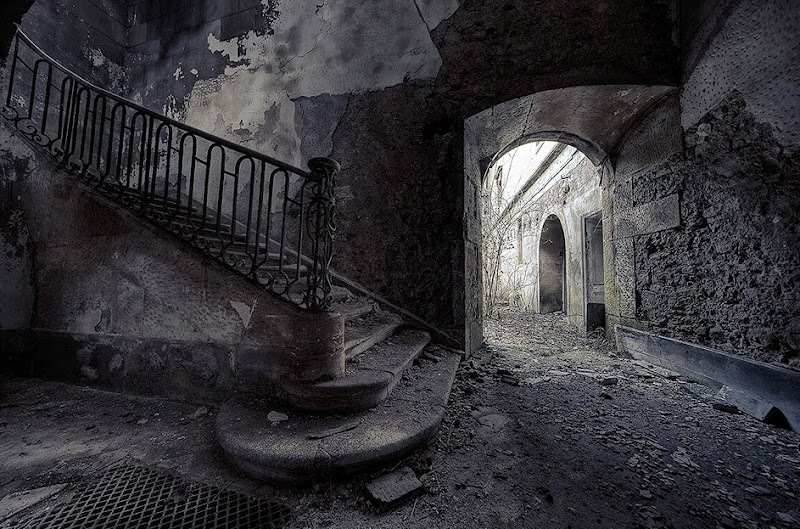 I came across these haunting photos of decaying stairways, and just had to share. This old abandoned building has a story to tell, I'm sure. I love how the light is playing on the wall. Notice the map? Hey, a little paint and elbow grease, who knows, this could have potential! These are the ultimate "before" photos! I wonder what these staircases looked like in their day. Now they are just sad, decaying remnants of their former selves. Even in a state of disrepair, the photographers through their lens, captured a certain beauty. I am amazed at how the light and texture of this photograph was captured. 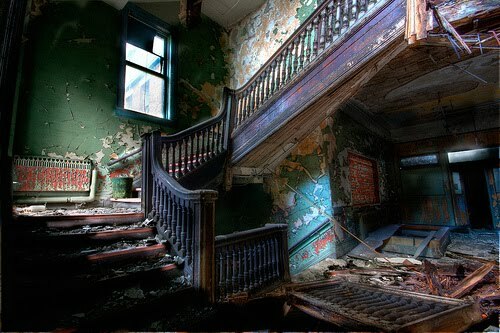 This staircase is nearly 700 years old, surviving fire, war and abandonment, it's now in an advanced stage of decay. These photos fascinated me. 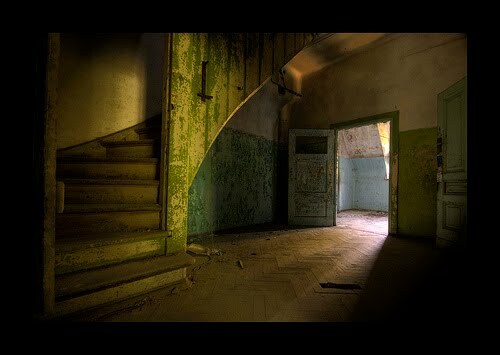 If you are fascinated too, check out these websites that feature photography of urban decay here and here. Suddenly, a little chipped paint on my stairway isn't bothering me anymore! I'm linking up to Susan at Between Naps on the Porch for Metamorphosis Monday. Depending on how you look at these photos, they are either "before" or "after." 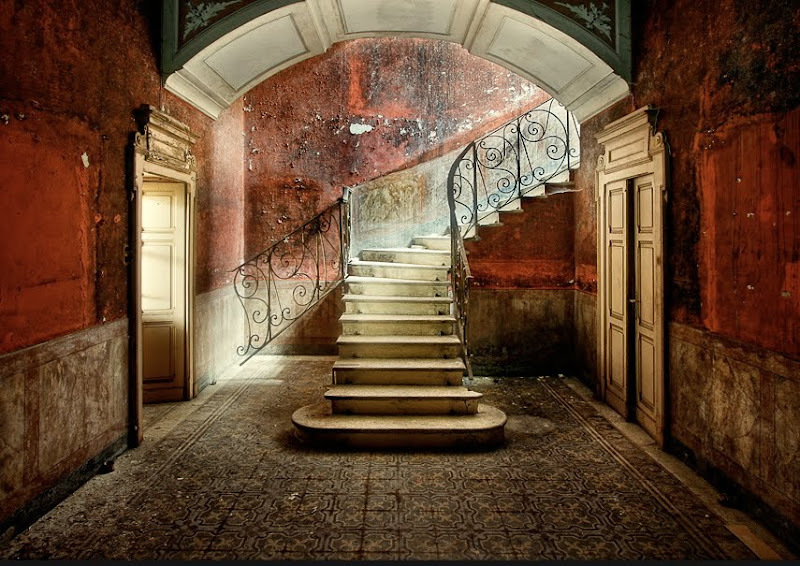 Imagine what these stairways used to look like in the past, or how they can be restored for the future. I adore these photos. some of them you just imagine a lady descending, silk skirts rustling. Some even older. Reminds me some of Beirut. Old bombed out buildings mixed in with the newly refurbished ones. Who were the people who lived there? And where are they or their descendants now? They are all beautiful. I just imagine in them in their glory and yet they all are, as you say, hauntingly beautiful...as is. 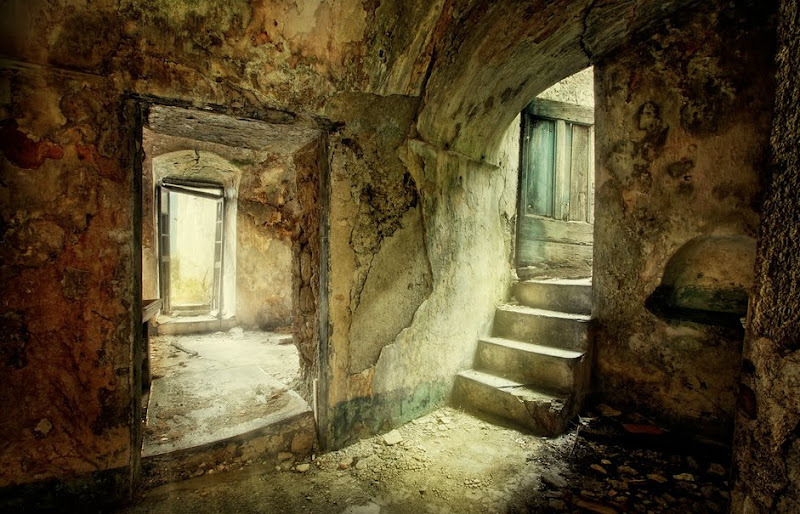 I wonder who lived there and how these magnificent places became so worn. The fourth pic down immediately reminded me of a famous staircase at an old church in Santa Fe, NM. It is built with no support underneath at all. This looks very similar in the way it is built. Very interesting post, thank you Delores! Ohh the stories they could tell!! Think most are beyond repair but amazingly beautiful. Beautiful images and oh my, the stories they evoke! These are hauntingly beautiful. 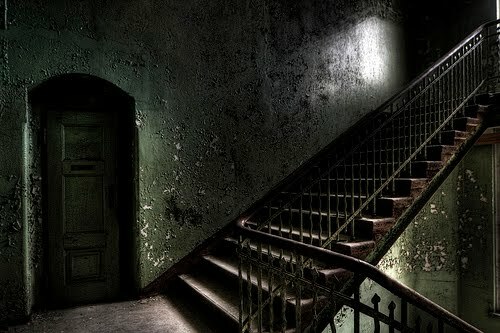 I have a favourite vintage haunt that has a staircase that leans so far to the right, I fear going upstairs as I think the whole building must lean as much. But the treasures upstairs are so wonderful, I simply must risk my life. Thank you for finding these interesting photos of such an unusual subject. 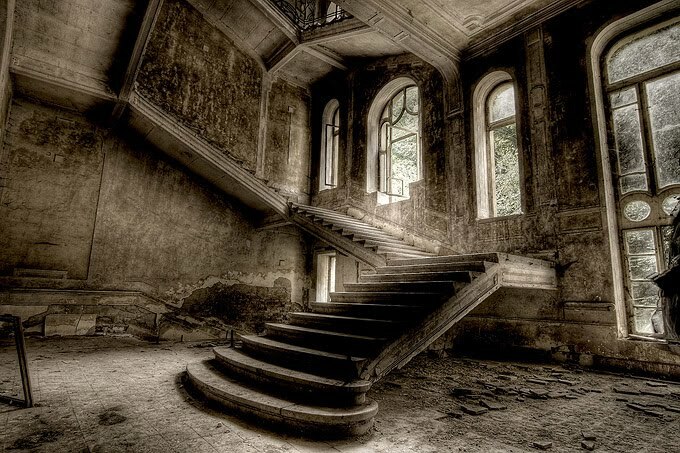 It just makes you wonder why anyone abandoned these homes...the must have been beauties in their day! Beautiful in their decay...very moving. Thanks for this look at a different kind of interior. Don't you just wonder about all of the people that went up and down those stairs? How many Rhett and Scarlett moments? How many brides? Good times and bad? I always find that fascinating. We have an old house, but not nearly that old or dilapidated. I wondered those things about our house and contacted all of the previous owners or their families. It was amazing the stories they had to share. Nice post. It is sad but you are right beautiful at the same time. I would hope that someone with a great deal of sensitivity would come along and "restore" these places without destroying their haunting beauty. Don't you know that had to have be absolutely beautiful at one time. Oh I love these photos!! Isn't it amazing how beautiful crumbly and peeling can be!! In Love With Mill Valley!